You’ve got a busy day ahead! If part of the day’s work is spraying, it’s tempting to kick on the sprayer as the morning sun lights up your crop and soil. If you’re spraying a herbicide, you don’t want to spray when an inversion is present. 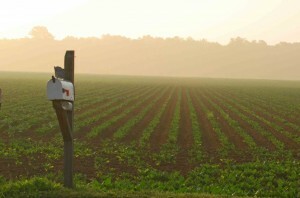 Morning mist is a visible indicator of an inversion, but don’t assume an inversion is gone. The mist maybe gone, but inversion may still be in place. 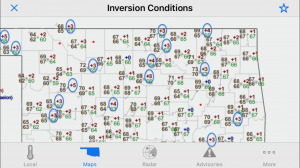 Read on for a sure way to know when an inversion has fully dissipated. 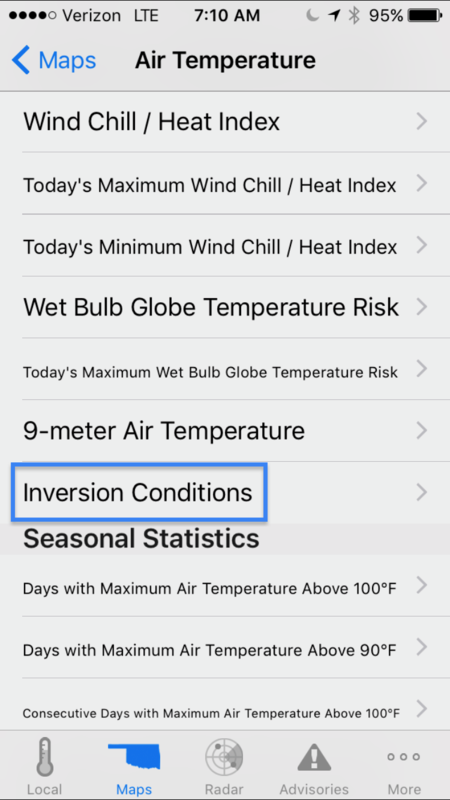 Inversions occur when the air temperature near the ground is cooler than the air temperature higher up in the sky. 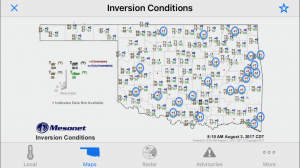 In Oklahoma, the Oklahoma Mesonet has maps of inversion conditions updated every 5 minutes. 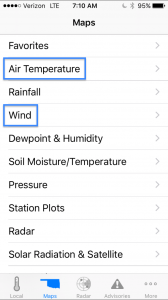 Mesonet towers are 33 feet tall with an upper air temperature sensor at 30 feet. Lower on the tower is an air temperature sensor at 5 feet. 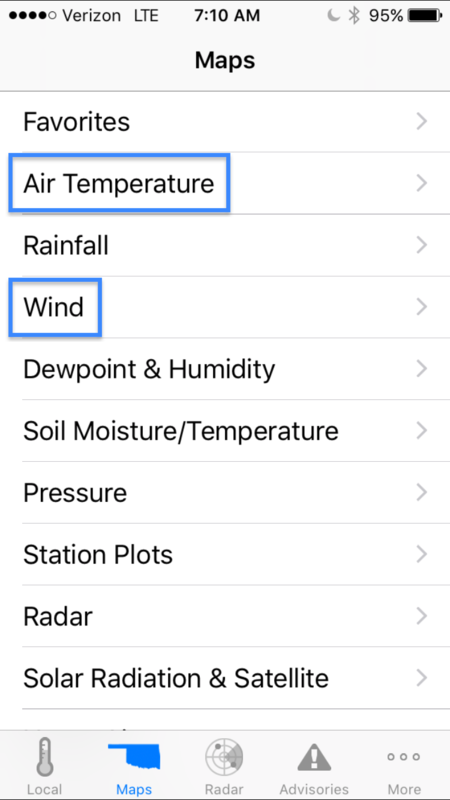 When the 30-foot sensor is warmer than the 5-foot sensor, an inversion exists. Inversions are shown as red values with a plus sign. When no inversion exists, values are blue with a minus or in the case of zero blue with a plus. Here is the same map zoomed in. Inversions with a temperature difference of 3 to 5 degrees are circled. To the left of the circle are the 5-foot and 30-foot air temperatures. 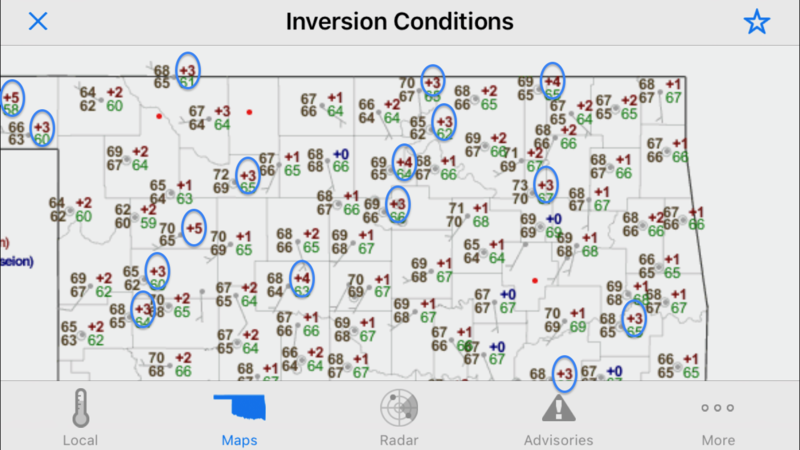 The higher the temperature differences the stronger the inversion. 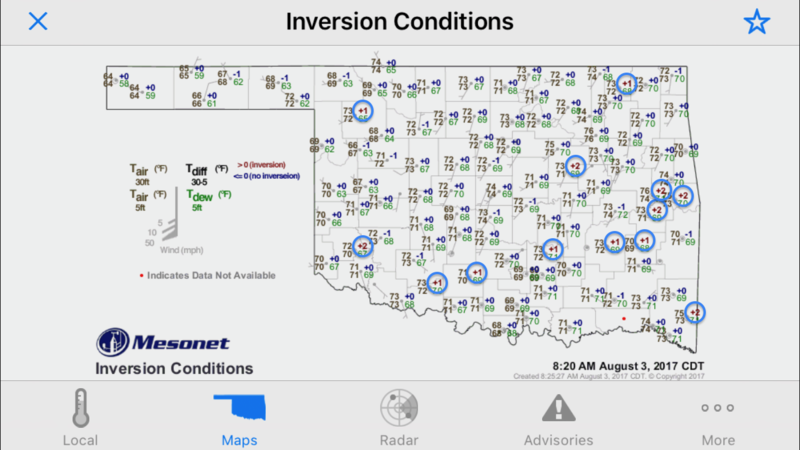 The previous inversion maps in this blog post were 7:00 AM maps captured on August 3, 2017. At 8:10 AM that morning, there were still 22 locations in the state with inversions in place (circled values). Ten minutes later, Mesonet sites with an inversion had dropped to 13 locations. Another Mesonet tool that is useful to assess the risk of small particle movement is the “Dispersion Conditions and Winds” map. 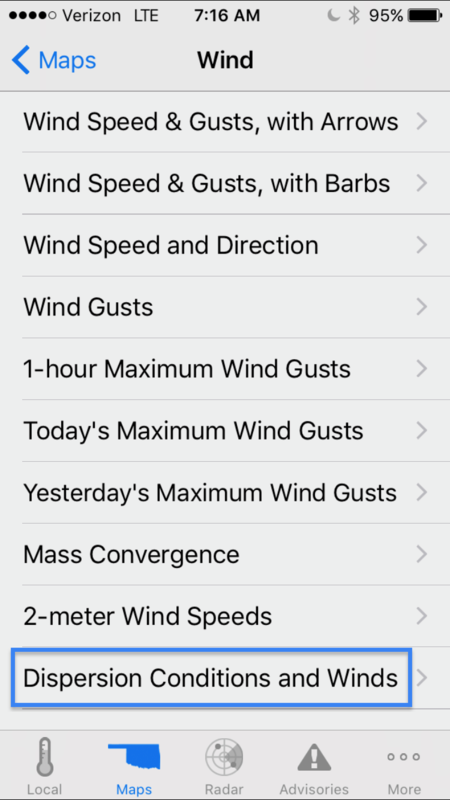 You’ll find it in the “Wind” section of the Mesonet iPhone and Android apps, highlighted in the app menu list above. 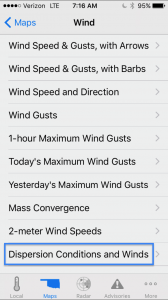 After selecting “Wind,” you’ll see “Dispersion Conditions and Winds” listed in the Wind section. The dispersion model leans more heavily on wind speed than air temperature so there are differences at times, but the two models correspond well, because low wind speeds are needed for inversions to form. Going back to 7:00 AM on August 3, 2017, the dispersion conditions were poor to very poor (2 and 1 Dispersion Index values) over much of the state. When dispersion conditions are poor, small spray particles hang together. These can move offsite and impact sensitive plants. By 8:10 AM, dispersion conditions had improved over much of the state. Areas near Mesonet sites with Dispersion Index values of 4 or above are places where small spray particles will disperse rapidly both horizontally and vertically. As these small particles disperse, they become less concentrated and the risk of impacting offsite sensitive plants drops rapidly too. 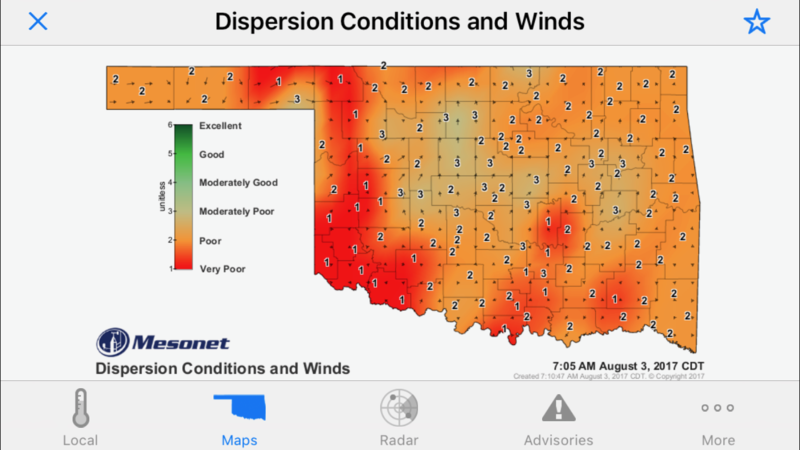 Ten minutes later at 8:20 AM, there was considerable improvement in Dispersion Conditions, especially in southwestern Oklahoma. With the Oklahoma Mesonet phone apps, it’s a breeze to check inversion and dispersion conditions before you load the sprayer or in the field. On the Oklahoma Mesonet full website, the Inversion Conditions map is at http://www.mesonet.org/index.php/agriculture/map/agriculture_essentials/dispersion/inversion_conditions and the Dispersion Conditions map is at http://www.mesonet.org/index.php/agriculture/map/agriculture_essentials/dispersion/dispersion_conditions1. 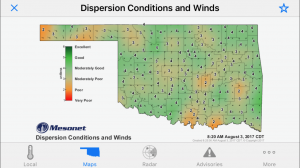 The full Mesonet website Dispersion section also has animated, statewide Dispersion Forecast Maps, single site Dispersion Forecast Tables, and single site Past Dispersion Tables at http://www.mesonet.org/index.php/agriculture/map/agriculture_essentials/dispersion/dispersion_conditions1. 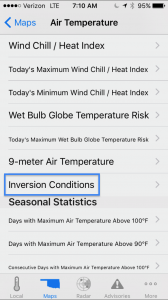 For a down-to-earth, in-depth review of the weather conditions that lead to inversions, refer to this illustrated, online article by Jason Deveau with the Ontario Ministry of Agriculture, Food and Rural Affairs at http://sprayers101.com/surface-inversions/. Al Sutherland serves as Oklahoma Mesonet Agriculture Program Coordinator and Oklahoma State University Assistant Extension Specialist. He is a Certified Crop Advisor and Certified Professional Horticulturist.